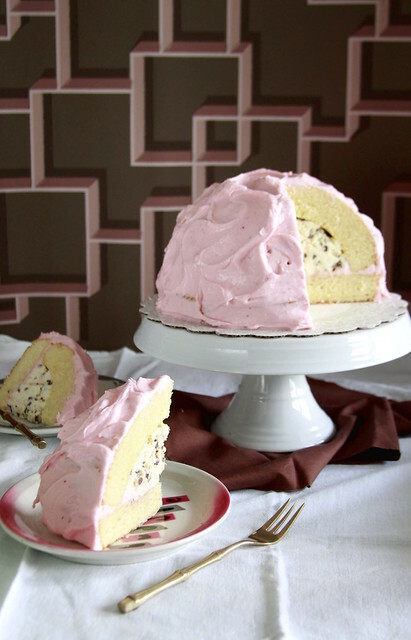 Let’s fuse the old and new worlds with this Italian American Cassata Cake! 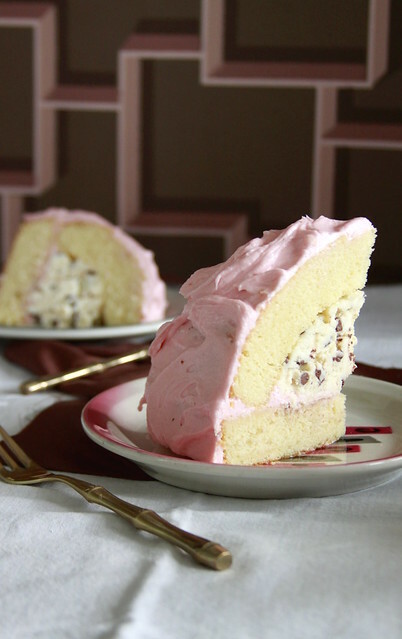 The shape of this cake mirrors Italy’s classic cake, but this version has Americanized flavors with a yellow butter cake, strawberry frosting, and Italian-American chocolate chip cannoli filling! With memorial day coming around the corner, it’s hard not to be nostalgic and patriotic with American pride. 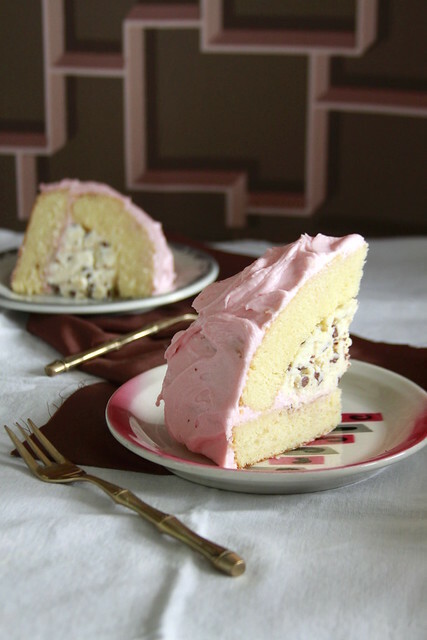 This Italian American Cassata Cake represents the fusion that occurs in America. Like sedimentary rock, the social ladder layers people above people. It is the same way recipes are layered upon prior peoples’ interpretations. A crusty layer of nostalgic tradition competes with a desire for newness. What do soldiers defend when being American troops? People see America as a frontier, pioneering forward with the idealization of success and ‘making it.’ In some way, these veterans protected and represented a longing. It is a romantic perspective, this homey American dream. In America, I don’t think we see this. We want to see it. We want unearth the Puritan boot-strap-pulled ground-up success, as if it could solve all of 2017’s problems. This dreamed America is some mid-20th century, G.I. Bill bolstered, America we wished existed. If anything America is seldom stagnant. Nothing stays still. It either morphs or decomposes. A cassata cake means several different things, it’s definition constantly shifting. In Italy cassata cake is a domed cake light and sponge-y and filled nuts and dried fruit suspended in a ricotta filling. However, in America, cassata is the dessert of Italian-American Cleveland residents. It stacks custard and fresh strawberries between layers of airy chiffon. 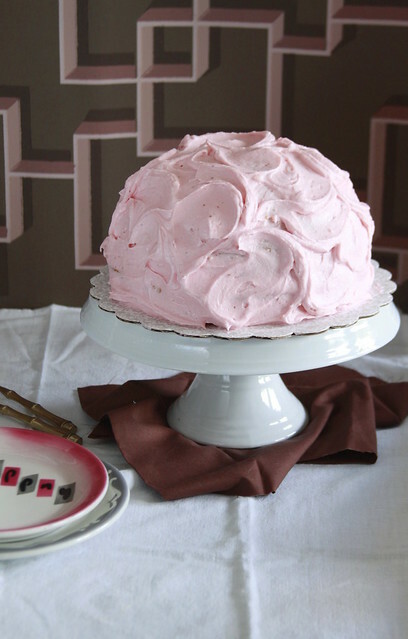 This cake blends the image of a classic Italian cassata cake. The Italian American Cassata Cake is domed with a round shape and stuffed to the brim with a ricotta based filling. The newness—the hybrid American flare— comes with the butter cake. Unlike chiffon, the buttery yellow cake is an Americana standby. Yellow cake is not only sturdy, but it is also moist. Its exudes a powerful milky-vanilla taste, but this type of cake is a gentle companion, complimenting the robust flavors of the cannoli filling and strawberry frosting. Instead of a fruit and nut based ricotta, I opted for a classical chocolate chip cannoli filling. As a flavor, cannoli exudes Italian-American dessert. Reflecting the Cleveland cassata cake, I went with the flavor of strawberry, but used it in the frosting. 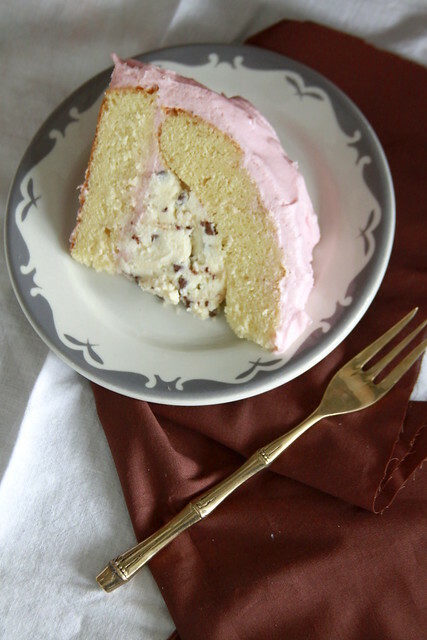 Let’s remember, meld, and create from the memories of the past with this Italian American Cassata Cake! Preheat oven to 350 degrees F. Grease the baking dome, dome insert, and cake pan with baking spray, set aside. Sift cake flour, baking powder, baking soda, and salt in a bowl, set aside. In a stand mixer fitted with a paddle attachment, beat butter on medium-high speed until smooth and pale in color, about 1 minute. Scrape the bowl and paddle down, add the sugar, and beat on medium-high speed again, creaming for 2 minutes. Lower the speed to medium, add the eggs on at a time, beating welling after each addition. After the last egg, scrape sides and bottom of the bowl down. Whisk the sour cream, milk, and vanilla in a small bowl. On the lowest speed, begin adding dry-mixture in 3 additions alternately with the wet-mixture in 2 additions, beginning and ending with the dry-mixture, mixing until the flour just disappears. Use a rubber spatula to give the batter a few stirs. Divide batter between pans, filling the pans only to the preset line. Bake the round cake for 20 to 25 minutes until a toothpick inserted comes out clean with a few moist, not wet, crumbs. Invert cake onto a wire rack to cool completely The dome cake will take 50 to 65 minutes to cook. It'll be hard to check the cake in the dome. Let cake cool completely in the dome, keep it in the dome until assembly. Use a rubber spatula to smooth out the mascarpone. Add imapastata and blend by hand until incorporated. Do not think of using a mixer of electric beater, it will make the cheese super grainy. Stir in powdered sugar and vanilla. Fold in chocolate chips. Refrigerate until ready to assemble. In a stand mixer fitted with a paddle attachment, beat butter and cream cheese on a medium-high speed until smooth and lump free, about 2 to 3 minutes. Scrape the sides and bottom of the bowl down. The with mixer on low, slowly add powdered sugar, salt, vanilla, and strawberry puree. Raise speed, beating until smooth and combined. It may look a little softer than normal frosting, but this is okay. Put into a container and refrigerate until firmed up, about 2 hours. Dollop frosting onto a cake board and secure round cake layer. 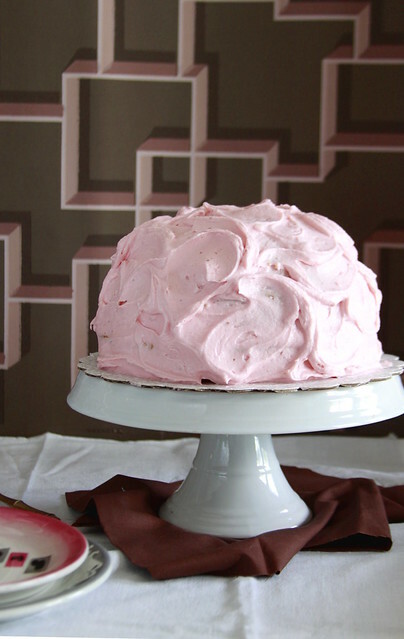 Apply an even layer of strawberry frosting to layer. Spoon cannoli filling into cake dome and invert dome onto frosted cake round. 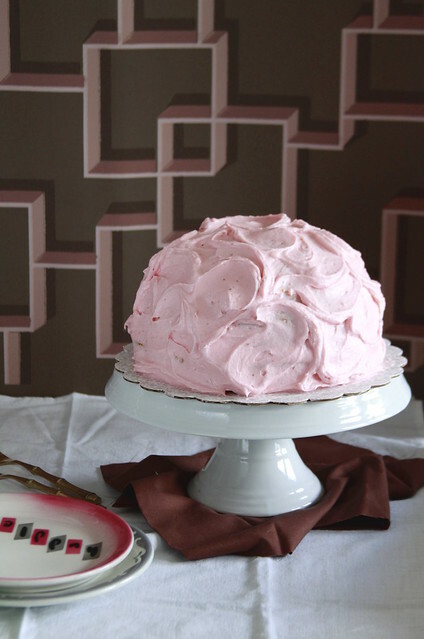 Cover cake with remaining strawberry frosting. Use the back of a spoon to create swirls.